In 1967 British astronomer Jocelyn Bell Burnell was left stunned by mysterious pulsing signals she detected coming from outside the solar system. For months she suggested the signals could be of an extraterrestrial intelligent origin, but they were later proven to be rapidly spinning stars known as pulsars. 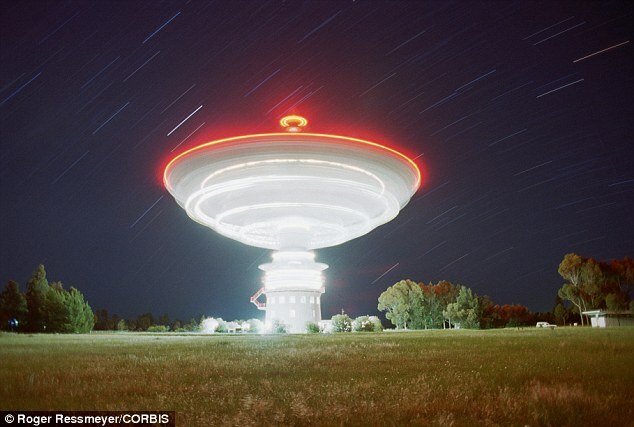 However, a new series of mysterious signals, known as Fast Radio Bursts (FRBs), has again got astronomers scratching their heads and wondering if, maybe, we’re picking up alien messages. FRBs are radio emissions that appear temporarily and randomly, making them not only hard to find, but also hard to study. WHAT ELSE COULD THE SIGNAL BE? Some stars are known to suddenly flare up on occasion. It’s possible that this event could send light through the thick ejected layers of a star’s atmosphere in bursts, but if this were the cause we would expect to find FRBs towards variable stars (ones with fluctuating brightness) in our galaxy, which is not the case. 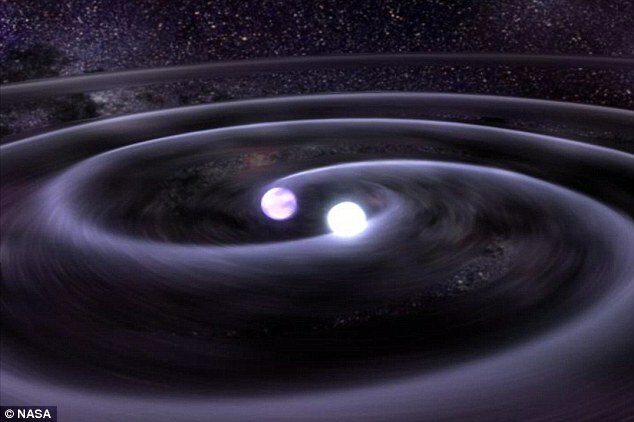 When two white dwarfs merge its possible they can combine into a larger, rapidly spinning white dwarf. This event could emit radiation from the poles consistent with FRBs and, if this is proved correct, it could indicate an association between FRBs and supernovae. Ultra-dense stellar known as neutron stars could collide and release huge bursts of radiation before they merge – this event is already thought to be a cause of high-energy bursts known as Gamma Ray Bursts (GRBs), and could also be the cause of FRBs. Some neutron stars are regarded as being ‘supramassive’, which means they are so massive they should have already collapsed into a black hole but their rapid rotation keeps them alive. When they do suddenly collapse they release an intense burst of radio waves known as a blitzar, and within this emission FRBs could also be residing. The first FRB was spotted, or rather ‘heard’ by radio telescopes, back in 2007 – but it was so temporary and seemingly random that it took years for astronomers to even agree it wasn’t a glitch in one of the telescope’s instruments. 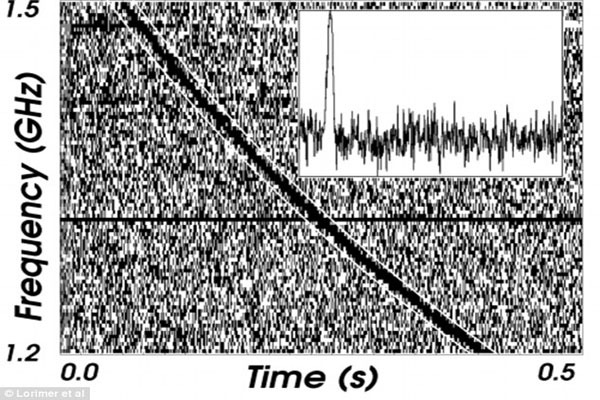 The signal, which lasted just five milliseconds, was named the Lorimer burst after its discoverer, Duncan Lorimer. The radio emission was so dispersed, experts suggested it must have come from a great distance away, possibly billions of light-years. But early estimates said there should be 10,000 of these events a day – so the fact that another wasn’t discovered until 2012 was troubling. This was when data from the Parkes Radio Telescope in Australia suggested it had heard another FRB, along with a handful of others, but the fact that only Parkes had detected the signals had some claiming these were merely instrument glitches. A recent discovery, in April of this year, of an FRB using the giant radio dish in Puerto Rico confirmed to astronomers that these signals are indeed real – but they’re no closer to finding out an answer as to what they are. Theories so far include flaring stars, white dwarfs merging, neutron stars colliding and – most intriguingly – alien signals. ‘This extraordinary finding either indicates an as yet unknown or unusual astronomical phenomenon, or it could indicate that this is a vast alien communication network, and the universe is teeming with intelligent life forms,’ says Nigel Watson, author of the UFO Investigations Manual. ‘Every unusual signal from outer space encourages us to wonder if it is from an alien civilisation. ‘Since this signal seems so elusive and hard to interpret then this should be a candidate for further analysis. For now, however, FRBs remain very much a mystery. It will take further studies and observations in future to truly determine where they come from, and what is causing them. Until then, it’s difficult to rule any particular theory out of the window.